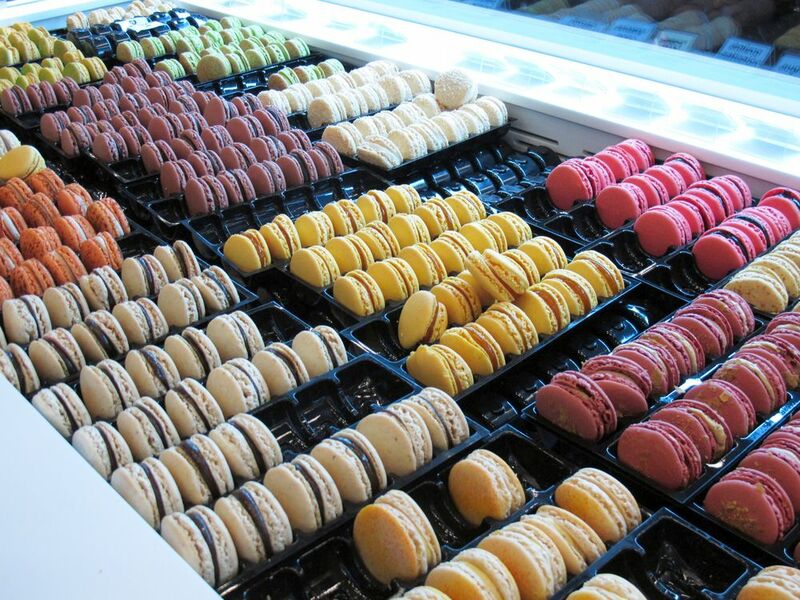 I enjoyed many a macaron while living in Paris. Bite size puffs of airy sweetness are a perfect snack, dessert or afternoon pick-me-up. I never dreamed of making my own macarons, because a) I've never enjoyed the precision of baking where you can't really sample, tweak and revise on the fly and b) I really don't need to have dozens of these wonderful treats in my house. And let's be honest, the French and their cuisine can be a bit daunting to replicate. Their desserts could be displayed in world class museums. Then I was invited to the Food Bloggers of LA annual cookie and cookbook swap. I knew that these baking experts were not going to be pulling out the Nestle Tollhouse bag for some basic chocolate chip cookies. While I could be intimidated by both the baking prowess of the French and the food bloggers, I decided to do the best I could, and the results were a bit comme ci comme ça, and that's being way too kind to me. In the interest of full disclosure and realizing that many people struggle in the baking department like me, I decided to share my less than parfait attempt to make a macaron because what it turned out to be was actually a-ok in my book. I recently purchased Clotilde Dusoulier's The French Market Cookbook, which is a wonderful collection of vegetarian recipes from Clotilde's Parisian kitchen. The fresh produce in Paris always captivated me and while I love red meat as much as I like red beets, I still see the value and flavor in cooking right from the garden. Today though, I flipped to the back of the book and the dessert section where I found Clotilde's recipe for Old Fashioned Walnut and Chocolate Macarons. For the record, these macarons aren't supposed to be like the bright colored puffy cookies seen in Paris, and I definitely thought this played in my favor. These were billed as more rustic, and also a bit healthier - right up my alley, except for the whole baking thing again. While these were supposed to be more rustic, I was hoping for a little more lift in the cookie. In fact, when I brought them to the event, a friend remarked, "Oh, I love Florentines," looking at my cookies who were now going through a full on identity crisis. Florentines do have almonds and chocolate, but the similarities stop there. No matter what you call it or your baking ability, I still found these to be quite enjoyable, as did my fellow food bloggers who ate every last one. You usually can't go too far wrong combining nuts and chocolate, so pick a name and you'll likely be unable to stop popping these irresistible little bites. In a blender or food processor, combine the sugar and walnuts in short pulses until finely ground, but don't overprocess or the nuts may release their oil. Transfer to a medium bowl and add the almond flour, stirring to combine. In a separate bowl, beat the egg whites with one tablespoon of water and the salt until soft peaks form. Fold the egg whites in with the dry ingredients, being careful to lift the mixture to avoid deflating. Transfer mixture to a piping bag or sturdy freezer bag with a corner clipped to create a 3/4" opening. Pipe small 1" rounds on the parchment lined sheets, allowing about a 1" space between each. Try and ensure uniform size to create even sandwiches later. Use the back of a wet spoon to flatten the top of the piped surface. Bake until golden on top and lightly browned around the edges, 10 - 12 minutes. Remove from oven and carefully lift the parchment and give a cool rinse to the baking sheets and place the sheets back down on the wet pans. Steam will form, making it easier to get the cookies off the parchment paper. 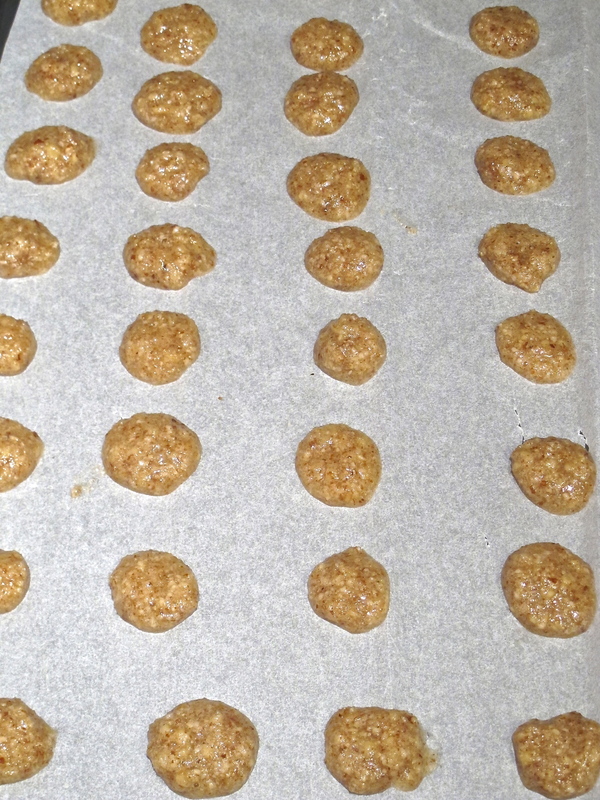 After 2 minutes, remove the cookies from the sheets and place on a cooling rack. Melt the chocolate in a double boiler until creamy, but not runny. Let cool slightly. Group like sized cookies together and then spoon chocolate on the flat half, placing the other half on top,. Repeat with the remaining cookies and chocolate. Allow to cool completely until the chocolate sets, about 2 hours. Keep in an airtight container up to 5 days.